In the modern age of the technology, almost everyone owns a site or two, and most certainly every business does. Every site is a major source of data, data which can be used for better understanding of the visitors and their preferences. Analytics. In my opinion, there are 2 basic types of analytics platforms that people are using on the web currently – Google Analytics and others. Using Google Analytics via Web Browser is a very common thing, and a lot of people do that on a daily (and some on hourly basis), and so playing & doing basic analysis of the information inside Google Analytics interface is a very accessible & easy thing. For those looking to export analysed data, it is easy to do with an “export” button which allows to have data exported into CSV, TSV, TSF for Excel, Excel, Google Spreadsheets, as well as into PDF. Well, my answer is yes & no. I can’t imagine anyone wanting to go into Google Analytics interface daily in order to export that information into CSV, copy it into some folder, open your preferred integration tool (mine is definitely SSIS :)), and then execute process for integrating this data into their Analytical platform or DatawareHouse. Would not it be nice, if there would be an automated plugin for automating those tasks allowing you to configure this type of information once and then simply import it into your preferred system ? 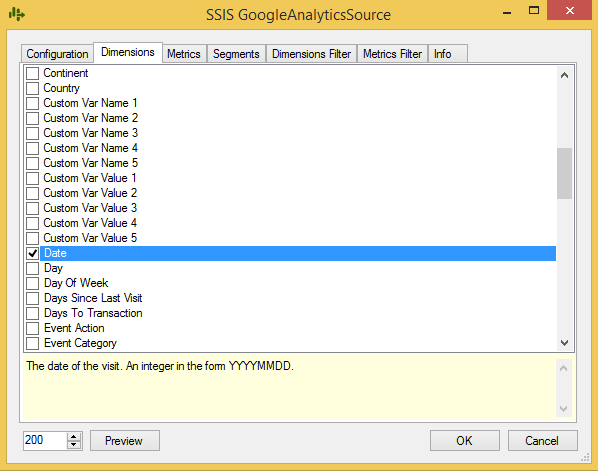 SSIS GoogleAnalyticsSource is the plugin that you might have been searching desperately! Developed by my colleague Tillmann Eitelberg from OH22 in his own free time, this is one more cool gift for the global community. 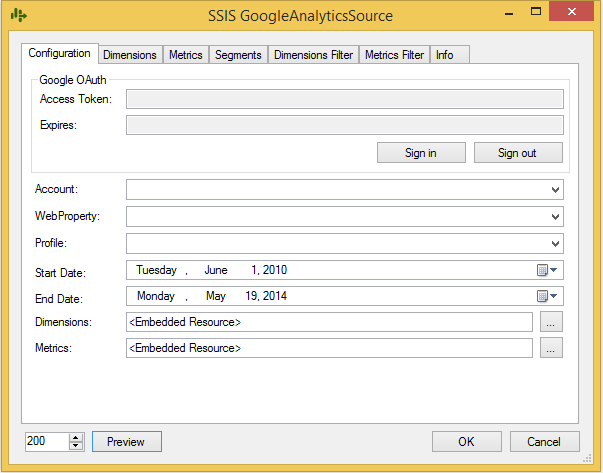 SSIS GoogleAnalyitcsSource is an open source plugin for SSIS which allows you to read data inside your Data Flow directly from Google Analytics. 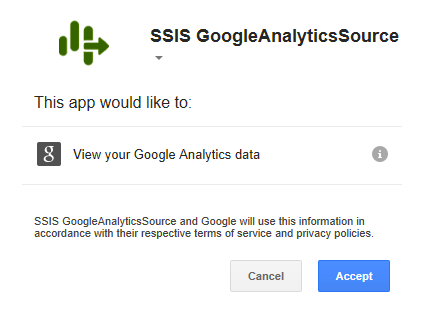 SSIS GoogleAnalyitcsSource is using oAuth 2.0 for authentication with Google Analytics, which is a kind of standard at this moment. Unfortunately, for the current version 1.6 Beta there is no automated installer. As a next step, simply copy all of those files into “C:\Program Files (x86)\Microsoft SQL Server\110\DTS\PipelineComponents\” folder of you installation. (In my case I am using SQL Server 2012, if you are using a different version, you will need to adjust the path accordingly to the version number). 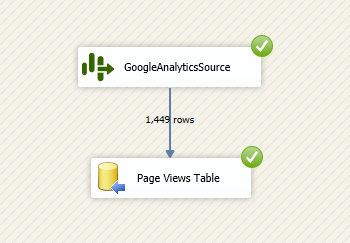 Google Analytics for SSIS Source is really easy to use: after creating a new .dtsx file, let us go and add a new DataFlow component as shown on the picture on the left (I named it “Read GoogleAnalytics”). 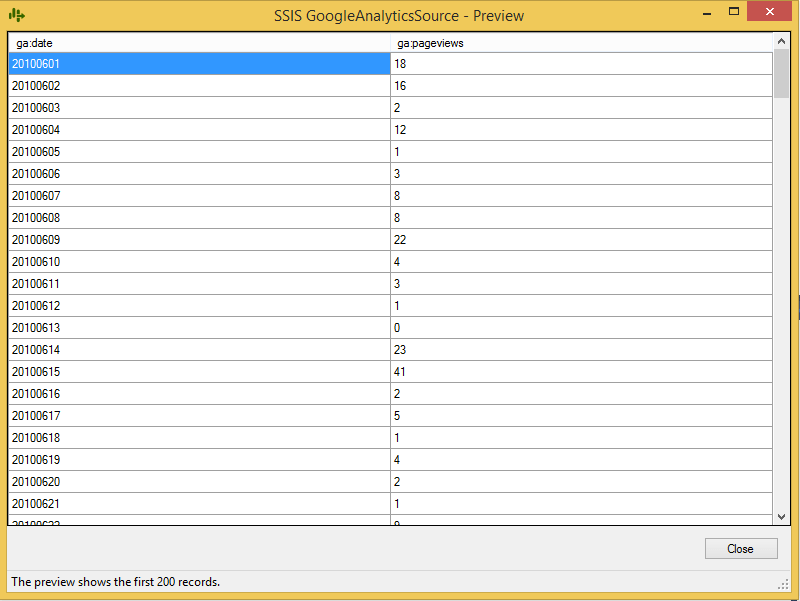 Inside our DataFlow, add a new Source Element – GoogleAnalyticsSource, as shown on the picture. It has a distinctive green icon which will help you to recognise it. After double click on our Source, you will be presented with the following screen of options as it can be seen on the left. As you can see on my basic configuration screen, the Access Token is already filled out, so the only things I have to select/change are Account, WebProperty and Profile. 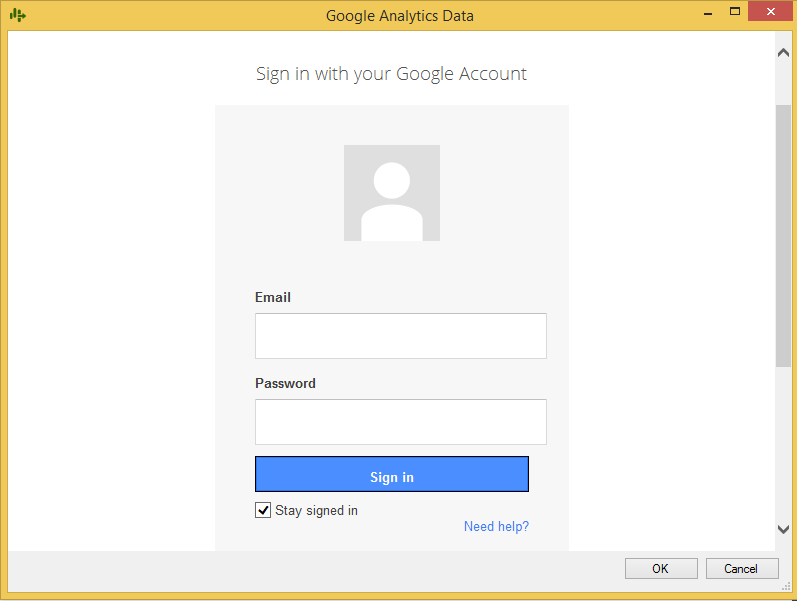 Account is your Google Account that you are logged in, If you are logged into multiple accounts at the same time, you will be able to select the one you will be using for the Google Analytics data extraction. Profile is the configured profile at the Google Analytics. There is a good amount of options available at the current version, which I might describe one day in a later post, but for the beginning we need to select 2 things: Dimensions & Metrics. For this exercise I will simply select the Date as my primary Dimension. My results will be delivered in a “YYYYMMDD” format which I can easily transform in SSIS into any format I need at my destination. We are not limited just by 1 Dimension and we can select multiple, but things will progressively become more complicated from here. One absolutely awesome detail about this screen is that every single Dimension has a description text at the bottom of the Dialog (with yellow background) and so it is enough to click on the Dimension without selecting it in order to obtain the detailed information of what type of information you will be served with. From the Metrics perspective I will simply select the number of Page Views as shown on the screen. This will allow me to get the detailed information on the amount of Page Views that my website was getting per day. As in the case of Dimensions I am not limited at just 1 Metric, I can actually go and select multiple, and oh my – there are so many of them that are listed at your disposure. Before advancing any further, you have an option of selecting preview of the data you will be getting – and for that you just need to click on the “Preview” button at the bottom of the Dialog screen. If you need you can select a different sample from the default (200 rows). You will be served 1 more Dialog screen where you will be able to see the first 200 (or any other value you choose) rows, that you can scroll and browse, making sure that this is exactly what you expect. After verifying all the data, click on the “Close” button and then on the “Ok” at the main Dialog screen to return back to the DataFlow editing. At the end, I simply added a OleDBDestination to my DataFlow, connected and mapped it to the provided and executed the package. -Did you registered all DLL’s with the respective GACUtil ? – Did you add a DataFlow and checked your “Common” Group? It is placed there, not under “Sources” Components. I’m having the same issue here. I can’t find the “Common” Group. I’m using BIDs which I think is running VS2008. All other steps are complete. Any idea where I can find this source element? I never tried using VS2008, I have had on those VM’s only VS 2010. I do not think that VS2008 is compatible with SQL Server 2012. First of all thank you for your post and your explanation regarding Google Analytics V3 installation. Following your instructions, I’ve been able to install the component on a platform running SQL Server 2012. However, I did not achieve to install it on SQL Server 2008 R2. In your previous comment, you stated: “(This path is valid for SQL Server 2012)”. Does that mean that replacing 110 in the path with 100 would do the job for SQL Server 2008 R2? A SSIS Data Source Component for SQL Server 2008 and SQL Server 2012 to load data from the Google Data API ?? The current version of Google Analytics supports SQL Server 2012 only (it should work with SQL Server 2014 as well). It is not compatible with SQL Server 2008 R2 and previous, but from my conversation with Tillmann there is no reason for not recompiling a new version it for SQL Server 2008 R2 for example. The issue has to do with the lack of time. Your blog is extremely helpful and insightful! Thanks! 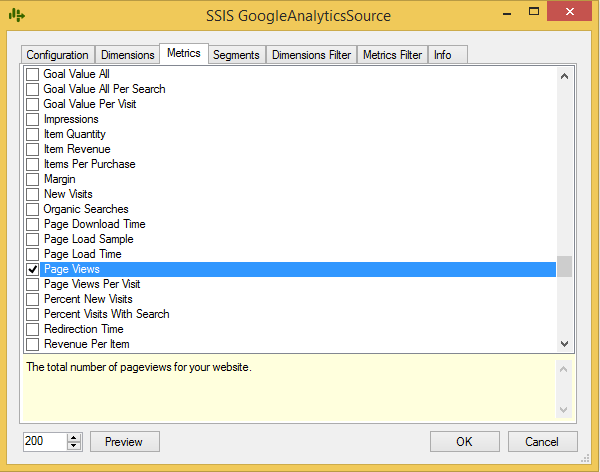 Quick question, do you know if Google Analytics for SSIS provides the dimensions and metrics for “Mobile App Analytics”? It seems that I’m only seeing the Google Analytics standard web offerings. I’m after a dimension named Screen Name and metrics named New Users, Screen Views. Thanks for any info! if you need an extra metrics just update it by including the metrics you are looking for. The idea is that with the time those files shall be updated at the CodePlex site, but you can simply go & edit your own file on your PC. Great, thank you Niko. I did check out the .xml files and seems fairly straight forward to add a metric or dimension. However, when editing the file I didn’t understand where I can obtain the ? From Google? you just need a random ID which should be unique within your Dimensions/Metrics. 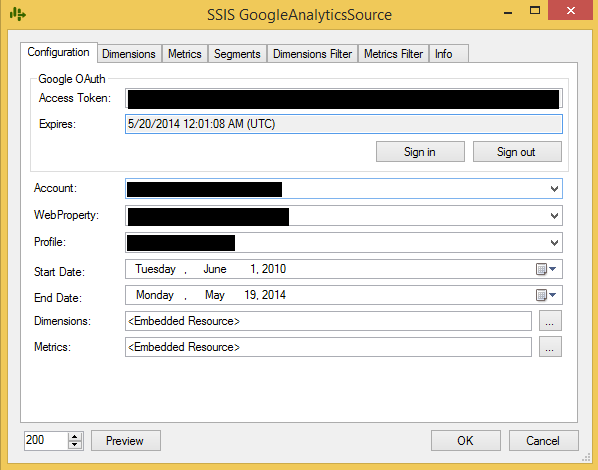 Quick question, do you have the Google Analytics for SSIS for Sql Server 2008 R2? Do you can grant for we? I hope somebody with enough time shall produce this version. I follow your steps and managed to log in, with automatically fulfilling the Access Token and all the other parameters, then I changed the WebProperty to Website however I can’t get any Dimensions and Metrics populated, did I missed anything here? this setting can be found at the bottom of the very first configuration tab. You will need to setup a File Connection Manager, and only after that you will have the list of available options. For the above version of Google Analytics Source , How we can provide Authentication ( Username and password) Dynamically . Because here i am finding only Token And Expiration date only. If you will see old version there we will be having UserName and Password option and we can provide by using variable (dynamically). What about current version ? And the thing is every time it generates new token . According to Tillmann, that since new version is using OAuth — there is no User/Password anymore and parametrising is not supported. “System.ArgumentNullException: ‘dataType’ argument cannot be null. I’ve tried modifing the Metric.xml file but it didn’t work, could you please give me some guidance or suggestion about that? did you try to filter out only the sessions that have engagement hits (https://support.google.com/analytics/answer/1006253?hl=en) ? Does the error still occur? Also, consider posting your problem to http://analyticssource.codeplex.com/discussions/576068, so that Tillmann can see and maybe answer on it himself. please help me,thank you in advance! Is there a way to pass user variable to the start/end dates? Nevermind….figured it out. I was able to do it in the Data Flow Properties->Expressions. can you please explain in brief how you have pass start date and end date. Using 2012 msi, I was able to login and choose my account, web property and profile. I also created new file connections one for dim and another for metric, then when I go to dimension and metric tabs, I don’t see any options listed. Do you know why? How can I get all those dimension and metric options populated? I have installed google analytic source-2014 msi and downloaded dim n metrics files also but yet I cant see google analytic s source attached in my visual studio. did you try to write to Tillmann (author of the plugin) ? I use VS2013 (although I have other versions if required) and SQL Server2008R2 – but I cannot get the install to work and show up in any version of Visual Studio – my understanding is that this is because I use SQL 2008R2 and not SQL2012 or higher. Has anybody managed to get this component working with OAuth2.0 and SQL Server 2008R2? Do you have something similar for Google Spreadsheets for SSIS for SQL Server 2008 R2? I am trying to find Google.Apis.Auth.OAuth2; for this but seems like it cant work with .net framework 3.5? I would appreciate any info! I have installed the 1.7 beta version for sql server 2014 in combination with sql server data tools for visual studio 2013. The plugin isn’t visible in the ssis toolbox after the installation. How can I manually fix this? Want to fetch combination of dimensions(Page,page level 1, page level 2, page level 3 ,date and pageview ) with Metric(pageview) but my pageview metric count is coming wrong so can any one help me out on this? Hi Niko, Thanks for the Google Analytics Source. It is very useful and helpful to my project. I got a quick question, everything is fine except for the dimension filter. May I know any solution to be able to use the filter? please ask the author at the plugin page about this. I installed the GA source successfully. My question is can we loop through the accounts in the Googleanlaytics site to get the dimensions? I need to loop through all the 3 websites to get the same dimensions. Is it possible? My pacakge runs fine in visual studio. It fails if I schedule pacakge. is there any solution for this? I have visual studio 2012 , Google anlaytical source 2012 msi and sql server 2014. It works find in visual studio but does not work when ran from sql server and also from job. Is there any solution please help. Got struck with this issue from two months and there is no one who really replies for the issue :( sad. I have visual studio 2012 , Google anlaytical source 2012 msi and sql server 2014. It works fine in visual studio but does not work when ran from sql server and also from job. Is there any solution please help. Nik, Atleast you reply , but it posted my issue long back on the site , no one replied. I feel if tillman ever sees any comments now :(. If you any idea which version of GA msi goes with SQL and visual studio version . Please respond. Hi komal, sorry i don’t have an idea. Tillmann has released that code as a free & open source. He has no obligation of supporting it. Maybe you should take over and develop it further ? Thanks for the amazing post. i was able to achieve what i wanted to. just one quick question. If I schedule my SSIS package to run daily does the OAuth token refreshes automatically after expiry? but please ask Tillmann, the author of the tool.